Hi! 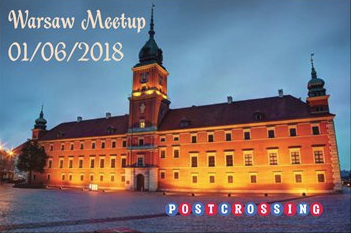 I'm an American postcrosser and I'm going to be in Warsaw for a few days, and I wanted to have a postcrossing meetup! So I am planning on June 1st, I would like suggestions from people interested on where we can meet. I will make a commemorative postcard for the occasion! I'm really excited, I hope there is interest. If the meeting starts after 4 p.m. I will probably come. Thank you! Sorry I didn't check this sooner, it doesn't notify me when people comment. I figured it would be in the evening somewhere, do you have ideas? I do not know where a good meeting place will be. Does anyone have a suggestion for a good place to meet at around 5-6pm? - or anywhere around Old Town if there will be ~5 people. Are you able to set an event? BTW there is 2500 people in "postrossing Poland" fb group. We can set a meeting on this portal as well if you want to meet many poeple at once. I was thinking about 10-15 people maybe? Do you think more will come? I'd probably like to keep it just to postcrossing unless you think that there won't be enough for just postcrossing people, I tried a meetup in my area and only got 4 people. As for the venue, what is the weather like outside in the beginning of June? Do most people wear t-shirts and hoodies? I don't mind being indoors or outdoors. I'm open to suggestions since I am a visitor to Warsaw and don't know it. Weather in Poland sometimes can suprise us but in general hoodies should be more than enough. I've checked postcrossing people on fb and at the moment +/-10 would be interested to participate. MiTo has an option to be outside or inside for such a group. If weather would be nice (no rain) then we could as well use an option like http://publolek.pl/?lang=en which is an open bar in green area. @corneliarumpshaker I would like to buy 15 your meet-up cards. I also prepared my own postcard for this event. The price is 0,50 PLN per card and will be avaliable at the meeting. For what I recall my last meetup when I was still in Warsaw was organisated at Czuły Barbarzyńca http://www.czuly.pl (they are now in new pleace looks bigger). Thank you for your suggestions! I was thinking of going from 5-7pm. 5-7pm sounds good I think. I think that it’s high time to decide about the meeting place. Yes, can someone in Warsaw decide on a place and reserve an area for 10-20 people? I don't know how many will come. I'm so excited! Pick the place that's easiest for people. I don't know anything in Warsaw, thank you! I am deciding that we try Czuły Barbarzyńca http://www.czuly.pl - will someone please call them and see if we can reserve a few tables? They have a sit down area? Hi, I'm planning to come, but it looks like I'll be with kids (9 and 2 year old), so I'll be happy for choosing child friendly meeting place. May be https://m.facebook.com/krolestwowwa/ is ok? It's a local cafe quite close to the center. If you think that is a good place, will you call them and reserve a spot for 10-15 people on Friday June 1st at 17:00-19:00? I need someone in Warsaw's help with that. Hi, reservation in Królestwo Wwa made for 1st June, 17-19 by Viktoriia Lazareva. And I ask your for 5 meetup cards of each type for me. VikSam thank you SO MUCH! that's awesome. I will gladly give you some of my cards, I am bringing 100 and only using about 30 of them, so I will give them out to people, I'll make sure you get some! Would you like to informmore people or you want to stay in smaller group? I don't kniw how many people already know and confirmed that there will attend. We're planning on 10-20 people. Please go to reply if you are coming or not so we know how many people are coming. Done. How many people you have so far? You're the first, I just created the survey. I'll keep the forum updated when I get responses. Thank you! See you there!